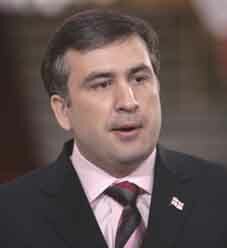 Georgian President Mikheil Saakashvili has said “there is no alternative to dialogue,” thus reiterating his proposal to the “radical” opposition that they should start talks with the Government. Speaking in Western Georgian town of Poti on March 7, two days prior to the rallies planned for April 9 which will demand his resignation, the President said the Government’s and the opposition’s “old practice” of not listening to each other has led to “catastrophe”. “Saying that “we are not interested in your opinion and we will do whatever we want to do,” which both the Government and opposition have done, has lead our country to catastrophe several times already,” Saakashvili said. The President noted that Georgia is facing multiple challenges at the moment. “Taking into account our past experience, considering that 20% of Georgia’s territory is occupied and a threat still exists and adding that there is a world financial crisis which hits everyone’s families, nothing can come before dialogue, listening to each other and looking for ways to compromise. We should reject our past experience. We should consider everyone’s opinion,” Saakashvili noted. The President said that in this respect the situation has improved a little in the Georgian Parliament. “Dialogue has also started in the NGO sector and between the regions. However, it is obvious that a dialogue is needed with even the smallest and most radical groups as well, no matter how unacceptable their demands might be, because Georgia simply does not have an alternative,” the President said. Despite the repeated calls for dialogue from the authorities, the opposition says “it is too late.” The leader of the Alliance for Georgia, Georgia’s former UN Ambassador Irakli Alasania, said offering dialogue is an “inadequate” reaction by the Government to the opposition’s demands. Commenting on Saakashvili’s proposal, Alasania said the resource for holding dialogue never expires, but “I am sure the Georgian people will come out on Rustaveli Avenue on April 9 and express their will. If the President takes the people’s will into account and wants to talk to his people, only after this might we hear a realistic and normal proposal from him about dialogue,” Alasania stated. One of the leaders of the opposition, former Presidential candidate Levan Gachechiladze, said the Government should lead a dialogue with “the Georgian people,” who want him to “resign peacefully,” and not with specific opposition representatives. “Dialogue will only take place live on air and only if Saakashvili bows to the demand of the people and resigns,” Gachechiladze told journalists after a meeting with representatives of the diplomatic corps. Dialogue between the Government and opposition and the April 9 rallies were discussed at a Parliament Plenary Session on Tuesday as well. Opposition Christian Democrat MP Giorgi Akhvlediani demanded that both the Government and opposition bear responsibility for the possible consequences of the April 9 rallies. “Both sides, the opposition and the authorities, should state clearly that they are taking the responsibility of ensuring that no provocations, illegal actions or violence will take place no matter how long the April rallies last,” Akhvlediani told Parliament members on Tuesday. Meanwhile Strong Georgia MP Giorgi Tsagareishvili criticized the Government for being “inadequate” and offered two solutions to the crisis: holding a referendum to find out if people want to hold early Presidential elections or impeaching the President. Tsagareishvili said the two proposals have one element in common – the will to change the Government by constitutional means. Tsagareishvili also said that the Georgian Patriarchate should participate in any dialogue and it should begin without ultimatums being issued. “We should show everyone that we are able to conduct a dialogue without foreign mediators,” Tsagareishvili said. The leader of Industry will Save Georgia, Zurab Tkemaladze, said that it is too late for dialogue. He said that dialogue is always the solution in a tense situation, “However, today we have different demands and face a different reality,” news agency Interpressnews reports.